In what he described as intensive “shuttle diplomacy” to restore ASEAN consensus on the South China Sea dispute, Indonesian Foreign Minister Marty Natalegawa touched down in Phnom Penh yesterday following trips to Manila and Hanoi in the past 36 hours. 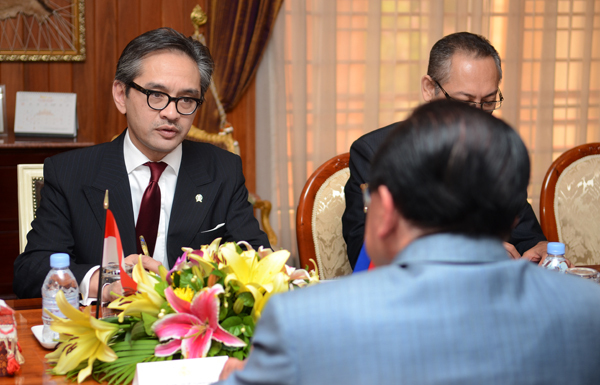 Stopping off before heading to Singapore, Natalegawa met with Cambodia Foreign Minister and current ASEAN chair Hor Namhong to thrash out the details of a statement on the issue that polarised member countries and China during last week’s ASEAN Regional Forum in Phnom Penh. “We, ASEAN foreign ministers, agreed in principle on a number of issues over the South China Sea issue,” Namhong told reporters afterward. Namhong provided no details of the agreements, but said he hoped to release a statement today pending approval from all 10 ASEAN foreign ministers. Negotiations on a Code of Conduct to tackle competing claims over the South China Sea broke down during the summit and led to the failure of the 10-country bloc to issue a final joint communiqué for the first time in its 45-year history. But Natalegawa told reporters he had spoken to all ASEAN foreign ministers bar one and said there was consensus on the basic principles of tackling the South China Sea. “The fact is, despite suggestions to the contrary … ASEAN remains united, ASEAN remains cohesive and therefore, ASEAN remains able to fulfil its role in the central and driving seat in our region,” he said. At the summit, he labelled the failure of ASEAN states to agree on key elements of the COC as “utterly irresponsible”. Four ASEAN member states have claims to the South China Sea. Two of the countries, Vietnam and the Philippines, have active disputes with China. China claims almost all of the waters, which carry about half of the world’s shipping tonnage, or some US$5 trillion in trade per year, and are thought to be rich in oil and gas. Chinese state-run news agency Xinhua reported yesterday that a fleet of 30 fishing boats arrived on Wednesday at a reef in the Spratly Islands, which are also claimed by the Philippines, Vietnam and Taiwan. The burgeoning super power favours a bilateral approach to negotiations for competing claims in the disputed waters, while US Secretary of State Hillary Clinton pushed for a multilateral talks at the summit. Cambodia has been accused of sidling up to China during the summit by stifling negotiations on the COC. It is an accusation Cambodian officials vehemently reject, pointing to the 130 points of the joint communiqué that were agreed to outside of the South China Sea. “ASEAN is proactive, so we are moving forward rather than the past,” said Foreign Affairs Secretary of State Kao Kim Hourn. Political analyst Lao Mong Hay said the fact that Indonesia had taken the initiative to patch up differences suggested the failure of negotiations last week had been serious.